Tinderbox vs. PersonalBrain. Grudge match or play nice? Tinderbox and PersonalBrain. Two relatively costly applications that do similar things. Why on earth would anyone need both? Forget for a moment that I’m basically crazy and have an illness we call Compulsive Reactive Information Manager Purchasing (or CRIMP for short) at outlinersoftware web site. These two applications are actually more complementary than they might first appear. Really. *In a seeming concession to this point, Eastgate has released the beta version of a new “little brother” application to Tinderbox called Twig. It appears to be a simpler, easier to use version of Tinderbox, although I haven’t played around with it enough to determine if it succeeds in this aspiration. PersonalBrain, on the other hand, is pretty easy to use. Most functions feel streamlined, especially creating relationships among my notes. It feels much more integrated with the web and other applications. For example, you can open and launch a new file in any of a number of other pieces of software from within PersonalBrain. That file can be stored within PB or elsewhere on you computer. In PersonalBrain it is easier to get an overview of your information by expanding the Plex view. My CommonPlace Book database expanded. Tinderbox excels at analysis. It’s a place for me to plan and think. The map view is especially powerful for this purpose. It also has a the ability to add key attributes (i.e. database fields), so it would be much more useful for structured information than PersonalBrain. Neither Tinderbox nor PersonalBrain excels for composing information within their limited editors, although both are serviceable, with Tinderbox having a slight edge. Tinderbox is the more complete application. That is, it can serve as an information manager, a structured database, a mindmapper, an outliner, a flow charter, a blog manager, a project manager, and probably many more that I haven’t thought of. The Plex in PersonalBrain is, however, more pliable than any of the views in Tinderbox. That is, you can scale it to see whatever level of complexity you need. You can even view your data in a quasi outline. The Map View in Tinderbox restricts you to one level of detail at a time. To see more of you information you need to switch to Chart or Outline views. There’s nothing wrong with that, but it may not be as smooth a work flow. It’s funny, as I write about both these applications, I find myself getting revved up over each of them for their own strengths. So, to get back to the original question, why would anyone need both Tinderbox and PersonalBrain? No one does. Not really. You could make due very well with either of these applications, or, in fact, with any of the dozens of other options available. For me, at least, Tinderbox and PersonalBrain are compatible and serve entirely different functions. I’m happy to support both developers. If I had to choose just one, I would probably take PersonalBrain because it is cross platform. If the long-promised Windows version is ever released, however, Tinderbox would be the application I’d select because of its incredible versatility. Fortunately, I don’t have to choose one or the other, and both applications can grace my MacBook. You might also find thinklinkr.com to be of interest: a Web 2.0 outliner that’s quite powerful and can export and import files. Free. Obviously platform independent, since it runs on the Web. I like it, and I did send the developers my set of Grandview manuals to help them think of features. I’ve looked at thinklinkr in the past, but now can’t recall much about it. I’ll have to take a look again. Thanks! Thinklinkr is now in full release (beta no more) and they really did add a lot. I’ll be very interested in your impressions of this current version. No, “complementary” was perfectly correct. Roughly speaking, it means adding to, or making perfect. See the Oxford English Dictionary. Ah, apologies — I didn’t twig that the correction had actually been made! (and that the original must have read “complimentary”). I’ll read things more carefully next time! I just took a look at the Thinklinkr video. 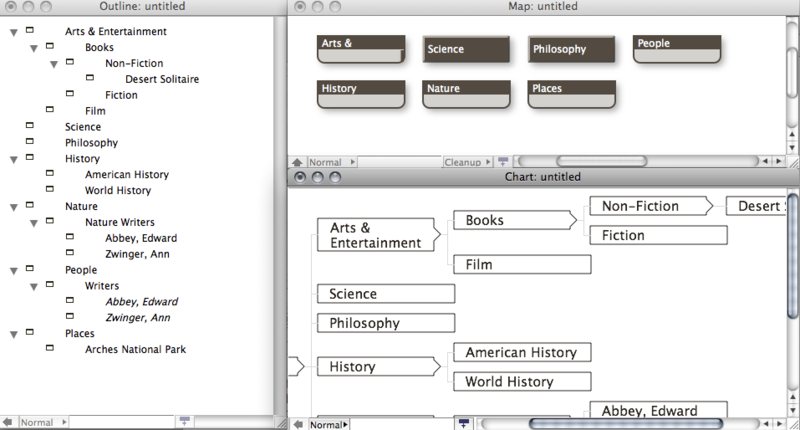 I can see how this can be an excellent tool for web-based collaboration and for basic outlining. It appears to lack some of the more sophisticated outlining functions, such as hoisting and cloning. I was disappointed that the video only mentioned columns, but did not demonstrate them. Also, it concerns me that it is free. I don’t see how it can be sustainable. But more investigation may be necessary! Thanks for checking out the video. There are a lot of sophisticated features that we are planning on adding – including hoist and cloning. We decided to start by focusing our efforts on creating a fast and responsive web UI and integrating real-time collaboration features that set us apart from other outliners. The columns section of the video was a bit premature. When we made the video we intended on introducing columns as the next feature. Columns keep getting delayed but they are coming soon. You’re right to be concerned about sustainability of a free app. We were completely free during beta, but with our last release we introduced pro accounts which cost $5/month. I found this when I was wondering whether I should re-explore The Brain as an analytic tool. I had tried it in the past and found that it was good in a kind of shallow way => linking ideas to other ideas, but not so good in looking back and trying to figure out the big picture. TB was much better about allowing me to just put information onto the screen without imposing structure. TB 6 is out now and its implications and reach are things I still don’t understand. I also don’t know if The Brain is actually more useful than I thought it was in my brief encounter with it. So I guess I need to revisit both applications. It seems that the Thinklinkr application that appeared in the responses to this posting has vanished. I wonder what it had to offer – perhaps some residue of the great but vanished GrandView outliner for DOS. Apparently nothing that could keep it available. Too bad. GrandView and its Mac counterpart More were really well designed outliners. Lotus Agenda and Ecco Pro were programs that took information and organized it in a way combined spreadsheet and database characteristics. All of these are now extinct and Tinderbox probably carries more of what they offered forward than anything else. By the way, Thinklinkr was a pretty basic outlining application with some wiki features, if I remember correctly. Hi, Stephen. Agree that Tinderbox is better as an analysis tool than TheBrain. I have not yet delved too deeply into Tinderbox 6, but what I’ve seen I like in general, but it is going to take some getting used to. Thank you for reading my blog and commenting. While I see the viability and flexibility of Tinderbox, the GUI, at least for my use, seems somewhat clumsy. Version 6 acts “jerky” on the screen when trying to scroll (MacPro OS X 10.9.2 – 20GB Ram), and toggling (hoisting or demoting) an outline level, works sometime and not others. It’s not intuitive in the least, again…, not for me. It’s more of a tool for programmers who want to build a complex system–and I’d like to build one, but the interface and screen graphics are just too basic and unpolished for me, with the power hidden deep in obscure layers. Granted, I intended to get started with it right out of the box, but rapidly realized I bit off a piece of software that reminded me of opening Visual Basic interface for the first time. Since leaving programming years ago, I don’t want to learn another “language” or procedural routine, to produce results. Some work with drag & drop would held make this more intuitive. Personal Brain, which I’ve used since its inception, and subsequently left behind, is pretty much a linear outlining tool, without the company-promised flexibility to drag and drop parent/child relationships and have them remain in the order desired. Instead, Personal Brain places the order of child links in alphabetical order, so in outline view the user cannot order the occurrence of the subordinate entries. The workaround is to prepend the entry with a number or letter; however, this negates the usefulness of changing one’s mind after creating a data structure. I’m still looking for a user friendly application. 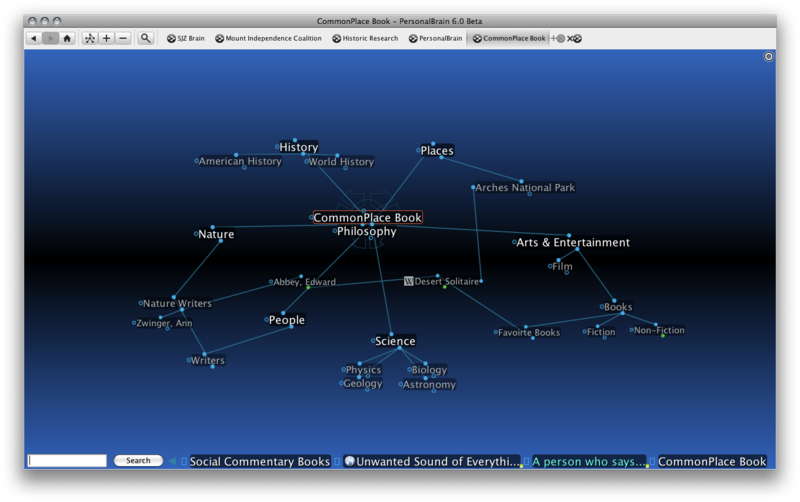 Cmaps, a flexibile “Concept Mapping” open-source program, works nice for creating sophisticated relationship maps, and, while the software resides on your computer, the results can be shared on the Cmap Website for collaboration, and did I mention, it’s free–although I’ve donated to the project. The downside to Cmaps is, it doesn’t possess a relational database capability without inordinate user intervention. All of these programs make for some utility, but I haven’t found the magic bullet. It’s probably on the way, but when? Tinderbox, from what I’ve discovered by playing with it, seems to potentially offer the most usefulness, but its complexity–at present–is a non-starter for me. Thank you for reading my blog and taking the time to comment. I can’t argue with any of your points. Regarding Tinderbox, my view is that to get the most from the application you do need to learn how to script it, but that it can be very useful even knowing just a minimum of these “high level” concepts. Whether this remains true in Tbx 6, I’m not sure yet, as I haven’t delved into it too extensively yet. I like a lot of what I have seen so far. As for PersonalBrain (now known as just TheBrain), I agree that the inability of the user to personally order the child thoughts is a failing. I’ve come to see TheBrain as a knowledge hub and not as a thinking/brainstorming or even creative environment. And I totally agree there is no “magic bullet,” not yet. Actually, I wonder if it will ever be possible to create the perfect knowledge support system. No need to apologize for a long comment. I enjoyed reading it. Thanks!